Join the discussion on our forums! Come discuss Twilight Elder over in our dedicated Twilight Elder discussion topic. At the end of your turn, give your C'Thun +1/+1 (wherever it is). Just doesn't understand those Twilight Youngsters any more - with their comic books and their rock music. A Russian voice is pretty good. Am I the only person who notices that he has only 4 fingers? Do you hear its caaaaallll??? This card screams for a ringtone. I have opened like a billion packs and have yet to see this guy? Obvious replacement to the Spider Tank. Power creep as it has a decent ability you can use in C'Thun decks. my turn 3 in Arena is smiling. Give me source please, it's very intresting. He's right, C'thun and his other minions that synergies with him will not be avalible in arena. 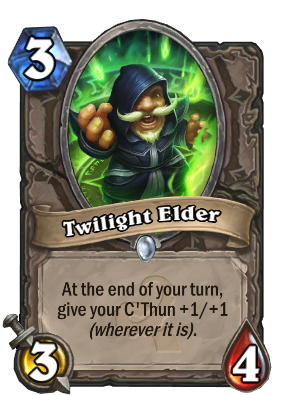 (wherever it is) does this mean that when you play this card , and next turn c'thun is summoned , c'thun gets the 1+/1+ ? C'Thun gets +1/+1 if he is in your hand, deck or on the board.